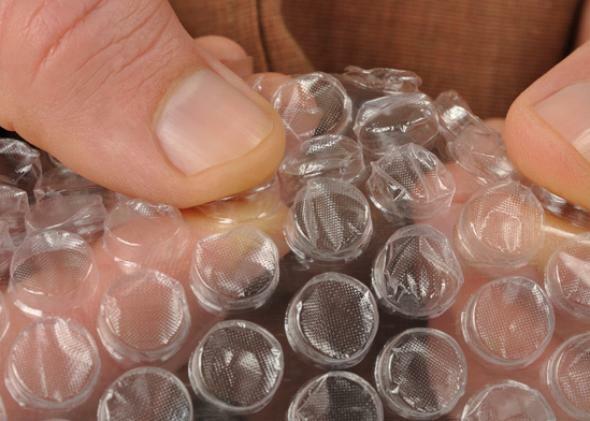 Sealed Air Corp's redesigned iBubble Wrap can't be popped. The only sane way to make bubble wrap. For all the jokes out there about sentient robots subjugating the human race, we do a pretty good job ruining things for ourselves. Sealed Air Corp., the original creator of bubble wrap and modern joy, is introducing a new packing material design called iBubble Wrap. And the bubbles don’t pop. iBubble Wrap isn’t inflated until it reaches its destination, so it saves a lot of space in transit. When buyers (largely retailers that ship products) receive the rolls, they will use a special pump to inflate the bubbles, but even then they won’t be poppable. The Wall Street Journal reports that packing technology was a $20 billion business in 2013, and competition between retailers (especially online sellers) to offer quick and convenient shipping has been fierce in the last few years. Any design adjustment that can save a few cents here and there can total big money at scale. Though Sealed Air’s founders invented Bubble Wrap in 1957, competitor products have slowly chipped away at the company’s dominance. The Journal reports that in 2010, Bubble Wrap contributed 5.7 percent of Sealed Air’s total sales. By 2012 it was down to 3.6 percent. Part of the problem is that bubble wrap is too large and bulky to ship long distances. In 2001, a Slate article about holiday packages said that bubble wrap “provided hours of bubble-popping entertainment,” and that’s been true for almost 60 years. But the drum of capitalism beats on. Even shipping technology is inevitably disrupted. Aldous Huxley wrote that “happiness is never grand,” and certainly a world without the simple pleasure of poppable bubble wrap is a brave new world.